Fishermen in Oregon out looking to catch hatchery-bred steelhead are none too pleased with just how few bites they're getting, and they want state researchers to step in and do something about it. For more than a century, waterways throughout Oregon have been stocked with fish from hatcheries to help preserve wild populations hit hard from overfishing, dams, logging, and other changes to their habitat. Generally, fishermen can only keep hatchery fish, which are marked by having a small fin on their backs clipped before being released. But despite the fact that these captive-bred fish outnumber the wild variety, they have apparently lost their appetite to fight. Experts say that after years of artificial breeding coupled with natural selection from being caught, hatchery fish have become less risk-taking than their wild counterparts which make them less likely to grab at baited hooks and, in turn, wind up as a "keeper." Anglers are upset, and they've called upon the Oregon Hatchery Research Center find a fix. 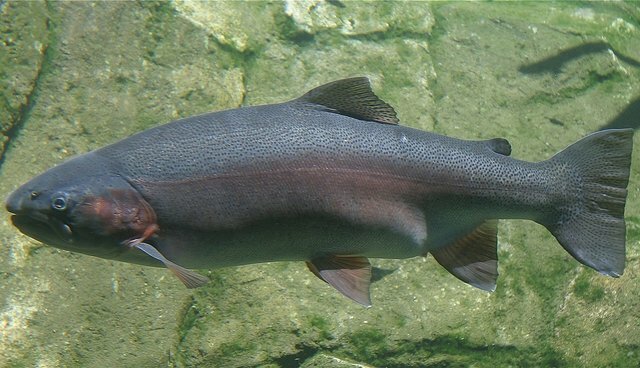 Interestingly, researchers there say it may indeed be possible, by breeding the wild steelhead's aggressiveness back into the hatchery stock, to produce better biters. "It's an exciting idea for us," said David Noakes, a scientist at the research center told the Associated Press. "Depending on what the answer is, we might be changing a lot of things about raising hatchery fish and stocking hatchery fish." This will be the first time researchers have undertaken a plan to put the nibble back in their hatchery stock, but they say it's likely achievable. Once wild fish are found to contribute to next year's captive-bred fish, it will take another year for them to be mature enough to be released.